We want to ensure that you are making the right choice in ERP. If you would like view what 585 has to offer you, let us give you an in depth tour of our software. We’d love to show you what we are all about! If you’d like to see if Ability might be right for you, please browse our online demos. For a more in depth look into 585 you can schedule a demo and an Ability 585 representative will contact you. Ability 585 ERP is committed to providing an ERP (Enterprise Resource Planning) solution that will exceed the expectations of your organization and provide the accountability to be successful in today’s economic climate. To meet the core manufacturing need of traceability, 585 is designed as a system that supports certification maintenance along with a clear understanding of the actual costs of production. Ability’s 585 development has resulted in the functionality that supports today’s lean environment resulting in better margins, cost reductions, process efficiencies and improvements in working capital. 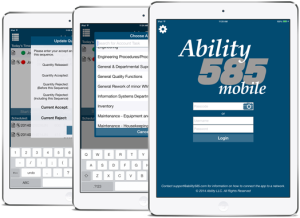 The Ability 585 software has modules to include: MRP, Project Planning, Scheduling, Orders, Accounting, Shop Floor, Etc. 585 brings tailored information technology to companies at an affordable cost, with a pay structure that is unique in today’s software environment. 585 is your best choice for Today's Job Shop and Made-To-Order Manufacturers! 585 Mobile has been developed to compliment the desktop version of 585. In the intitial version, users can clock in and out of jobs or accounts, view upcoming scheduled jobs, view job routings, view and add attachments, check on subordinates, and pull inventory for upcoming jobs. Users can search Jobs & Inventory and Log In by scanning barcodes generated from 585. 585 Mobile requires an iPad running iOS version 9.3 or newer. This module is used for employees to record clock time for jobs and tasks they perform throughout the day. The recording activity is used for Payroll purposes and for Job Costing. This module features the ability to reallocate time as needed. It also displays outside processing clock-ins made for when certain parts when they are at outside processing vendors. AllPart can be thought of as the Master Module for the other 585 Modules. As a primary storage depot for item and process information, AllPart provides necessary detailed information to other 585 modules such as nomenclature pricing to Purchase and Sales Orders, Routing and Work Center information to Jobs and Shop Floor, Unit of measure information to Shortage and Inventory. The Inventory Module is used to query and maintain inventory items in a variety of different modes depending on what the type of inventory transactions to be performed. The Jobs module is used to create and manage manufacturing Jobs for the enterprise. Manufacturing demand is created by orders from customers, other Jobs, and requirements for stock and setup quantities. Sales Quotes are estimates for goods or services. Like a purchase requisition (RQ), an SQ is informational and does not represent a current demand on company resources. A Sales Quote can be converted into a Sales Order. Alternately, a Sales Order may be created without first creating an SQ. 585's Accounting Module is used to process, track, and report financial information for the enterprise. The modular design facilitates separation of duties within the company, allowing interoperability with other 585 modules. This maintains continuity from purchasing and sales through Accounts Payable and Accounts Receivable, cash management, account posting and reporting. The Data Analysis Module is a Report Generator that allows individuals to select from a set of pre-programmed reports. Each report has a custom filter interface that is used to set parameters to select records for the report. The purpose of the Project Planning module is to communicate the completion status of the Sales Order prior to the job being printed. Project Planning can be used as intradepartmental communication tool. Additionally, Project Planning can be used as a to do list for tasks related to preparing a nomenclature for production. Quality is a module used to primarily track nonconformance issues. It uses Quality Log Numbers to track issues that you may incur during the manufacturing process whether it be on the production line or to handle and track returns. Presents a detailed view of jobs that have been created in the Jobs Module. Pending and Open jobs are listed in this module for tracking purposes. The Scheduler Module is used to assign and track the scheduling of Job Sequences as a product moves through the manufacturing process. On-time delivery of quality goods to customers is the goal of any manufacturing enterprise and the Shortage module is designed to meet that goal. A Demand for goods is created by Sales Orders and Jobs created with a stock quantity. When the demand for goods exceeds the supply, a shortage is created. Materials and other necessary items that have a shortage must be purchased or made to satisfy the shortage and in addition the shortages must be satisfied to meet customer due dates. Planners use the 585 Shortage Module to identify materials that are in short supply and when to have jobs completed and purchased items delivered so that deliver commitments are met for the customer. The Service Module can be used to track serial numbers and repair work done to the serial numbers over time as well as any recalls issued. The Contacts module allows for creating and editing new Companies and Contacts. This module stores relevant information for past and present employees, as well as applicants. Features in this module will allow tracking of vacation day usage and attendance, setting of shift start and stop times, and controlling PO purchase limits.